As both a stage lighting and teaching professional, On Stage Lighting’s Rob Sayer HND PG Dip FHEA is pleased to be able to offer stage lighting training in the UK within schools, drama societies and businesses and worldwide help online. Rob is an e-learning specialist and provides online stage lighting courses, live webinars and one-to-one tuition through computer-mediated communication (CMC). 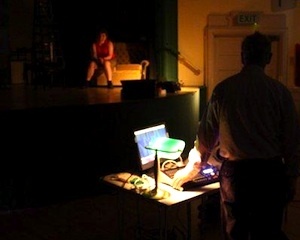 The last few years have been spent Alpha testing these methods with small learning communities of beginners in stage lighting, providing e-mentoring to lighting professionals and created ‘blended’ learning units for undergraduates and other stage lighting online learning. You can start some of our courses right now through the Instant Start series of courses. Here’s how. Our popular DMX Stage Lighting Systems and Introduction to Busking Stage Lighting courses are both now available as Instant Start courses. We also run training in the industry standard cueing and playback software QLab. This is available to users from anywhere in the world, both via an asynchronous online course or delivered to groups in real time using webinar and screensharing techniques. We get a lot of requests from individual applicants regarding hands-on stage lighting workshops. In general, we do not run ‘open’ workshops to a regular schedule for individuals to join. However, we do have a learning solutions to help learners from anywhere in the world. If you are an individual learner, you may wish to go to our virtual learning environment to see the courses we offer online. Check out our Instant Start courses and join the Guest List to hear about scheduled courses and events. Rob still designs and runs workshops and online learning for groups and businesses, based on your individual requirements. There is more Workshop Information here, including a rough guide to the process. Send an email to learn at onstagelighting.co.uk with your organisation’s training wishes and I’ll get back to you with suggestions and costs. Check out the following list of information that it would be helpful if you would send with your enquiry. Hoped for dates of workshop or generally good potential availability. Number of attendees and rough idea of the group’s current level. 1 or 2 major learning outcomes from the learning. What do you want attendees to be able to do by the end of the training? 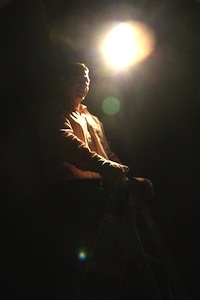 Bringing 20 years of experience in the theatre and event industry, Rob’s stage lighting workshops are grounded in professional practice and delivered to all levels of abilities. A former stage lighting professional and now Senior Lecturer at Bath Spa University, Rob leads modules in Lighting, Sound and Audio Visual as well as professionalisation training for graduates on the Theatre Production course. Qualified as an educator with a PG Dip of Professional Learning In Higher Education, the high standard of Rob’s teaching practice has been recognised by the Higher Education Academy with membership as a Fellow. Workshops are tailored to specific needs of a group and are often delivered in your own venue using your equipment, often over 1 or 2 days. Rob has worked in schools on light colour theory with 5 / 6 year olds, lectured as a guest at other Universities and led stage lighting workshops for drama societies. His style is fun and informal, encompassing practical elements of stage lighting along side relevant concepts and theories. Training sessions are hands on and everyone gets involved. Introduction To Stage Lighting and more..
CAD and planning software for performance and events. Including Vectorworks and AutoCAD. All stage lighting training are run at the pace and skill level of your group and designed to directly related to your own specific needs as learners. The workshops put professional lighting theory and practice into context with your own venue and equipment, making it invaluable learning for all attendees. Each stage lighting course also enables your group to reflect on future action to improve your lighting system or workflow, getting better results for the future. If you think that you or your group would benefit from some specifically designed stage lighting training, then email editor at onstagelighting.co.uk with some ideas about what you would hope to get out of a short On Stage Lighting course. We can then make suggestions regarding content and timings. If you are part of a drama society, it’s actually quite cheap to put on a course in your venue with 8 – 10 attendees. Don’t forget that the experience is beneficial, not just for lighting enthusiasts but also Directors and other members of your production team! Currently stage lighting courses are run in England and throughout the UK, but Rob does have a passport and, contrary to popular myth, is allowed out of the country. Had a committee meeting last night and everybody was full of praise for the day. It proved not only a fantastic learning experience but a chance for everyone to bond in a supportive and instructive environment. Very many thanks for a wonderfully professional and inspiring day. We all gain a huge amount from your skillful presentation and I hope we can in due course have another day to take develop our skills further. We all learned a good deal, & given that there were mixed abilities to begin with the whole weekend was pitched just about right. From my viewpoint (on-stage, producer & lighting crew type bloke) I have to say that it was a most enjoyable experience. The whole weekend was engaging and illuminating. For me being more used to having lights pointed at me rather than being on the technical side it was very useful to start at the beginning on the purpose of lighting and what it is intended to achieve. 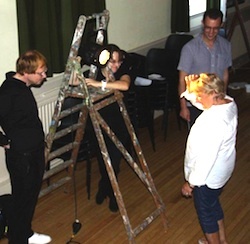 Images of a stage lighting workshop at Rottingdean Drama Society.